That didn’t translate perfectly but we get the point. There are some fixes to the automatic accompaniment. The new version takes about 15 minutes to install and during that time you can see all the styles and samples being copied over. Not sure if all or some were replaced but there are quite a few replaced during the upgrade. If you are interested you can download from here. Thanks John – A great find! Thanks for the feedback on the preset issue. Very interesting results from your test Curt, like you I would have expected there to be some consistency across the internal, external and VST systems. However, given Wersi’s “bung a bit more on as we go” approach to software development it’s not really that surprising. I would recommend passing this information on to Wersi as it would be useful in helping them identify the source of the problem. Ordinarily I would say don’t hold your breath, the late Colin Moore who ran the International Wersi Club had a list as long as your arm of bugs that needed fixing, features that didn’t work properly and suggested enhancements to the instrument. He regularly submitted this to Wersi and they regularly ignored it. In this case however it’s fundamental to the operation of the instrument, so they have to fix it. that holds on when . 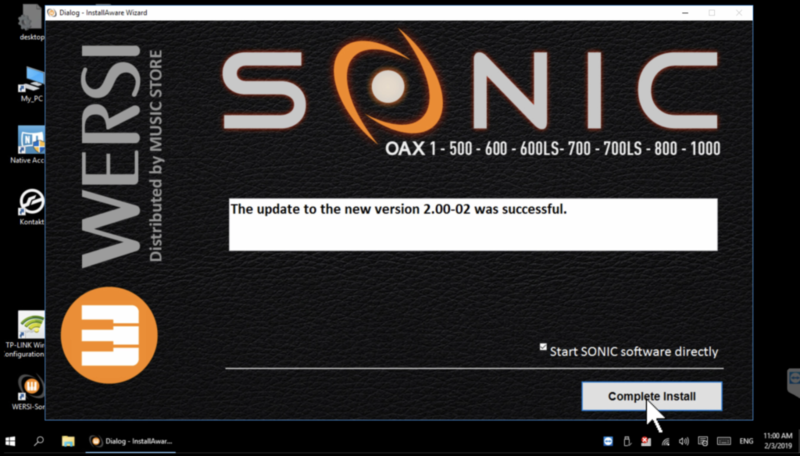 I just installed OAX 2.00-03 and YEP – It fixes the issue we have all been discussing. the next thing as I was trying some of my presets the change over was very slow. I know you had this issue I don’t know how you resolved this problem? any how it put it’s self right and is working ok now the next issue the screen shut down so I had to reboot so you can see why I was reluctant to change over. I have reported all these to Wersi. Ken. Kenneth – I did two things. First was to reinstall OAX and I also upgraded from 16 GB to 32 GB of memory. That was quite awhile, so I don’t remember the order that I did them in or which one was the ultimate “fix,” but the issue is now gone. So it turns out to be neither a feature nor a bug then, it’s a YAHBOO! (Yet Another Horrendous Botch-up On Oax). If we’re getting the sound cut off between presets then Wersi are not implementing the midi specification properly, and they need to fix it because it makes anything played in the legato style unplayable. NOTE TO CURT AND OTHER SONIC OWNERS. Before we make Wersi aware of this, in order to determine the extent of the problem I think it would be useful to know if this effect occurs also on the external midi system when controlling devices such as the Ketron, and on the internal system when using VSTs. It does happen on the internal VSTs. I noticed it with some of my presets that use Kontakt. I’ll test later this morning using external MIDI but based on above I’m guessing it will react the same. As a second test, I try the same test using a different MIDI controller to compare. Well – Not what I expected. First, we set up two presets using Wersi sounds. Strings on Upper1 and Piano on Upper2. The next preset has the same String sound on Upper1, but we changed Upper2 to a Flute, and as Geoff mentioned, when you change presets, you do lose the String sound on Upper1 until you re-key the note(s). Next, we created a registration on a Ketron SD90 with Stings on the Right Hand and for the 2nd Voice a Piano sound. Then we created a second registration with the same String sound on the right hand but a Flute on the 2nd voice. All of this was done directly on the Ketron and using Ketron sounds, but I’m playing the Ketron from the upper manual of the Sonic. When we manually change the registration straight from the Ketron touchscreen, the Strings continue to play as expected. You do need to rekey to hear the 2nd voice change. One last test. I created two user sounds on the Wersi that pick the Ketron registrations. When playing the SD90 from the upper keyboard of the Sonic and changing the Ketron registration from the Sonic (via a Wersi User voice to trigger the Ketron registration change) the Stings in the right hand continue to play. To compare I also set up the same registrations on a Ketron SD40 connected to a Komplete Kontrol keyboard. When I manually changed the registration on the SD40, it behaves the same as the SD90 attached to the Sonic. Based on Jerry’s comment when working with a VST, I expected the same thing to happen to an external MIDI device. Not the case in my testing. My dealer in southern Germany advised me, on my question, whether I should install this provisional version, that I would be better off waiting for the next final update in which also other things would be renewed or added. That seems to me a wise advice after the preliminary tests. But at least very good that you test it and I hope that the findings will be passed on to Ulrich Hack so that something can be done with it. I noticed a strange thing which may have been introduced with this update. When changing presets, if the same voice is used on both presets it doesn’t seem to be held across the preset change. As an example, set up preset 1 with an orchestral voice and a piano voice. Now set up a second preset using the same orchestral voice and a flute. Select preset 1 and hold own a key. The orchestral voice will hold indefinitely as expected whilst the piano will fade away as expected. Now whilst still holding down the key, select preset 2. The orchestral voice will come to an abrupt halt and it’s necessary to release and press the key again, which ruins the flow of the music. I would have expected the voice to hold across the preset change, but maybe I’m misunderstanding how it should work. However, I replayed some of my old video recordings and the voice does seem to hold across the preset change. I dont know if this is a bug or feature introduced with the latest update. Anyone have any thoughts on this? I’m not going to call it a feature or a bug. It’s more the nature of working with things that are binary. I have run into similar situations when working with various “digital” instruments. For example, in the case of OAX, I’ve noticed if you have headphones plugged in and power down the organ the next time you turn it on you will need to unplug and re-plug the headphones to mute the speakers. You are correct. It was working as you described before the update. One thing I really liked about the OAS system is you could select whether you wanted the preset to change the instant you selected the next preset or you could set it to where as long as you are holding down some keys, it does not go to the next preset until after you release the keys. OAS did so much more than OAX. I went back to Version 2.00 and verified it is a bug with the sounds cutting off during preset change. Thanks for confirming Jerry. I’ve thought about doing the same thing but never got around to it. I received a updated install file. Will install it tomorrow and see if it fixes this problem. Jerry – Yes, it does fix the issue. Still haven’t fixed the OX7 and VB3 drawbar save issue.